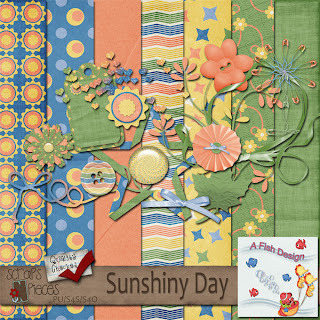 Did you miss LilyAnn's Week 1st entry into the Designer Darling Contest, Sunshiny Day? If you did you could still pick it up at her store at SNP. Are you tired of the cold winter days? Are you ready for some sun? This kit will take those winter blues away and bring some sunshine to your layouts. A Sunshiny Day will be 50% off until March 22 for $1.50! Preview is linked to the store. If you make a layout with this kit before March 22, you'll be entered into a drawing to get a $5.00 coupon to her store. Layout must be posted to A Fish Design gallery at SNP.